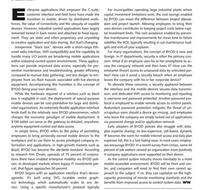 The WWEMA column in the March issue of WaterWorld magazine featured an article by Director of OEM Business Development Leelon Scott on the subject of Bring Your Own Device. This piece addresses the concept of device flexibility as mobile technology is integrated into the control system environment. There are several issues associated with allowing employees to use their own mobile device in such an environment, and the article discusses those thoroughly. Read Bring Your Own Device.